We are delighted to welcome Andy Hutchings and Company to Chester Little Theatre with Spectrum. This will replace our May production. We do hope you will enjoy these three new plays. 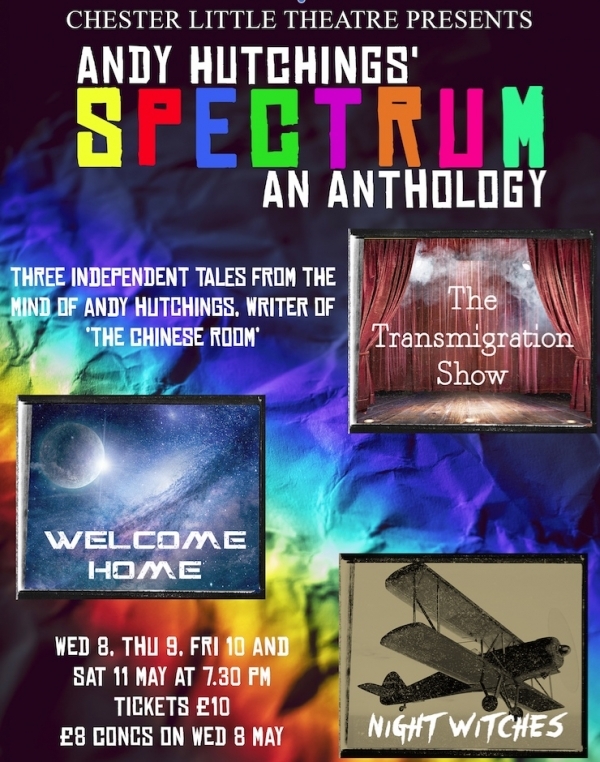 Spectrum is an anthology of original one act plays by Chester playwright, Andy Hutchings. Each of the three plays is a unique story exploring its own themes and ideas, put together to form an eclectic evening of theatre. From horror and survival in 1940s Siberia, to the comedic yet poignant afterlife of the modern era, all the way to a tale of mystery and melancholy set thousands of years in the future, Spectrum aims to explore who we were, who we are, and who we have the potential to become.